With no sign of a Nexus device ever showing up on Verizon’s network again, we’ve heard from a number of you during the whole Nexus 5 lead-up, who claim to be leaving Big Red behind for prepaid pastures. Now that the phone is official, we’ve also heard from a number of you who are looking for advice or at least information on a few of the most popular prepaid networks. Over the last year, I have actually tested out a few of them, so hopefully with this post, I can help shed some light on what could be an intimidating new arena for many of you. Before we get into your options, it’s probably best to give you a little explanation of what prepaid is. Think of prepaid as no-contract, mostly no-nonsense wireless service. Each prepaid carrier has its own quirks, but for the most part, you pay on day 1 for a month of service, and then get to decide after that month ends if you want to pay for another month or walk away. There are no contracts in prepaid. You pay up front for whatever amount of service you are looking for. And that’s the beauty, as you aren’t locked in for more than (usually) a month at a time. There are prepaid plans through your typical carriers (AT&T, T-Mobile, Verizon, etc.) and then there are MVNO providers, which are essentially companies who have made deals with big carriers to use their network. So someone like Straight Talk has made a deal with AT&T to offer prepaid service over AT&T’s growing network. There is nothing wrong with an MVNO, but they typically don’t have the same level of customer service or support as a traditional carrier might. If you like a hands-off approach to your wireless service, then that shouldn’t be an issue. With typical wireless service that you may be used to, you are paying for what the industry calls “post paid” service. Post paid essentially means that you have signed a contract for a set number of months or years. Chances are that many of you are switching over to prepaid because you are buying the Nexus 5. But should you not want the Nexus 5 yet still want to leave your current carrier, you need to start focusing in on phones and which carrier’s networks they are compatible with. Your best (easiest to find) resource, as odd as this sounds, is to hit up Wikipedia for reference. If you want U.S. cellular frequencies for all carriers hit up this reference. If you want a list of U.S. LTE bands hit up this reference. When you buy an unlocked phone, the listing should tell you which frequencies the phone works with. Match it up to those two links I just showed you and you’ll know which prepaid services you’ll be able to go with. The Nexus 5 works with almost everyone’s network outside of Verizon’s. You’ll get service on T-Mobile, AT&T, and Sprint, with 4G LTE on all of them. To see all of the wireless bands it works on, hit up our Nexus 5 specs page. I know that’s the most bare bones instructions for picking out unlocked phones, but it’s probably a subject worthy of its own post. If you are looking for a prepaid plan from one of the big carriers, look no further than T-Mobile’s plans. For one, almost all of their plans are now almost technically prepaid. They let you sign-up for service without a contract at some of the most reasonable prices you’ll find in the industry. They have essentially pulled the subsidy cost of phones out of their plans, leaving them below almost any other carrier. When you sign-up for T-Mo service, you don’t choose between contract or prepaid plans, it’s really just all mostly prepaid (at least in style). But what I think makes them so attractive, is that they don’t do overages or try to limit your data consumption as much as carriers like Verizon or AT&T. With T-Mobile, you get unlimited data with all of their plans, but then they limit you on how much data can be used at full 4G speeds in a billing cycle. So depending on the plan you go with, you’ll only be given so much high-speed data access. After you hit your limit, you are dropped to 2G speeds for the rest of your billing cycle. At the start of the next cycle, you jump back up to 4G speeds. 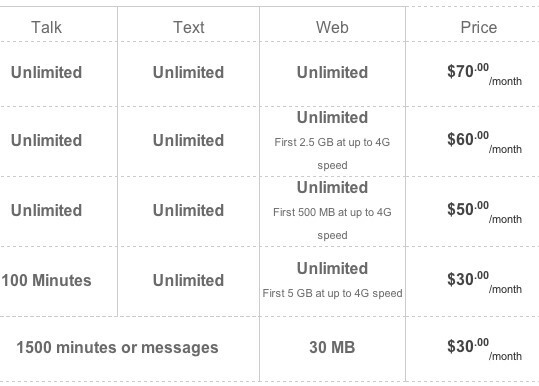 So T-Mo has plans ranging (listed above) from $30 up to $70 per month, with varying amounts of high-speed data. At $70 for their top tier plan, you get unlimited talk, text, and 4G speed data. Verizon doesn’t come anywhere close to an offer like that. If you don’t need that much 4G speed data, they have plans at 2.5GB and 500MB that drop by $10 increments, if unlimited talk and text is still important to you. But if unlimited talk isn’t something you care about, there is one plan that T-Mobile offers that should get everyone’s attention – the $30 plan. Even if you just want to test the waters to see if T-Mobile service will work for you, this is one to consider. For $30 per month, you get unlimited text and data (with a full 5GB at full 4G speed). The only downside is the limited 100 minutes of talk per month. With that said, for many of you who are considering a move from another carrier, but maybe want to test out T-Mobile’s service, this is a great option. Oh, this $30 plan also doesn’t play nice with Google Voice initially. For whatever reason, Google Voice and T-Mobile prepaid aren’t friends, so in order to get your GV voicemail working, you need to call T-Mobile and have them shut off the voicemail on your T-Mobile line. Once that happens and marinates for a few hours, all should be well again. T-Mobile prepaid plans work with their 4G LTE network. Should you run into service issues at any time, you’ll also get T-Mobile support, rather than the hit-or-miss support you can run into from an MVNO. More info at T-Mobile’s site. Aio Wireless is AT&T’s official prepaid partner. They offer three different plans, all of which can connect to AT&T’s 4G LTE network. Like T-Mobile’s plans, all of them offer unlimited talk, text, and data, yet they cap your full 4G speeds at certain data amounts depending on the plan. They offer 250MB ($40), 2GB ($55), and 7GB ($70) full 4G speed plans, but will then throttle you for a billing cycle once you hit those amounts. The biggest problem with Aio has to do with a speed cap before you ever get to those pre-set data amounts. Aio is completely up front about this, but you should understand that they limit the LTE download speeds on their plans to 8Mbps. If you are coming from another carrier and saw 15Mbps and above, this could come as a shock. Granted, 8Mbps is still plenty fast, but it’s not exactly breaking records or impressing anyone. So you are throttled to 8Mbps to begin with, for say your first 2GB if you choose their $55 plan, and then throttled more heavily once you hit 2GB in a month. I’ve been using Aio for a few months now and haven’t really been bothered by the 8Mbps limit, but some of you may. One thing to keep in mind with Aio, is the fact that it may not be around much longer. AT&T just introduced them, but there are reports already suggesting they may shut the service down if their Leap Wireless acquisition is successful. If you do sign-up for service with them, this move won’t really affect you all that much, you’ll just have to find a new prepaid carrier should that happen. But there are plenty, so I can’t imagine you’ll complain all that much. 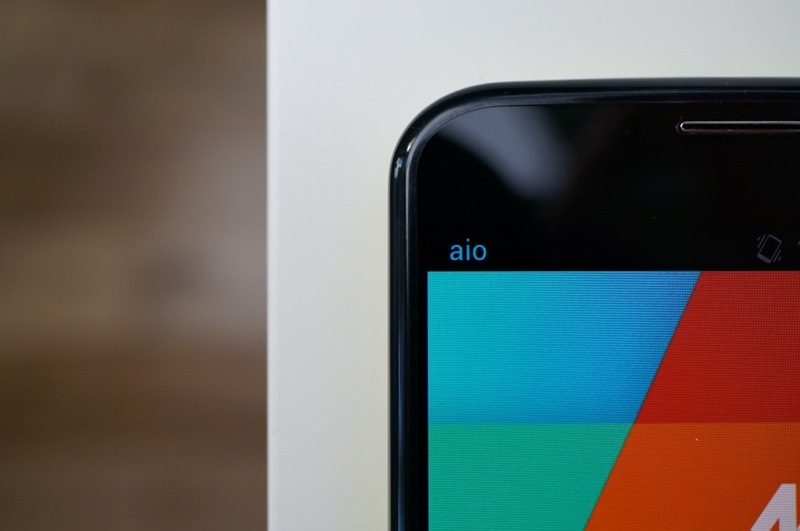 In the end, Aio Wireless has been a solid player for me, plus you should feel a little more secure about service with them knowing that AT&T is actually in control and they aren’t just another MVNO. They also get to use AT&T’s massive network, which most would argue is right behind Verizon in terms of reliability and far ahead of T-Mobile. 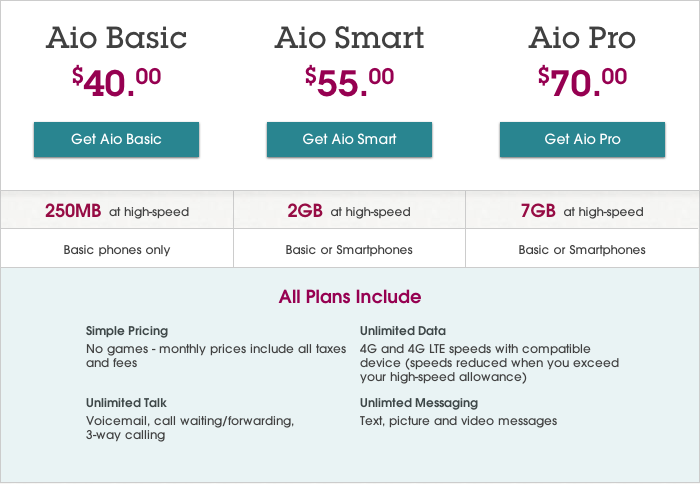 More info at the Aio Wireless site. 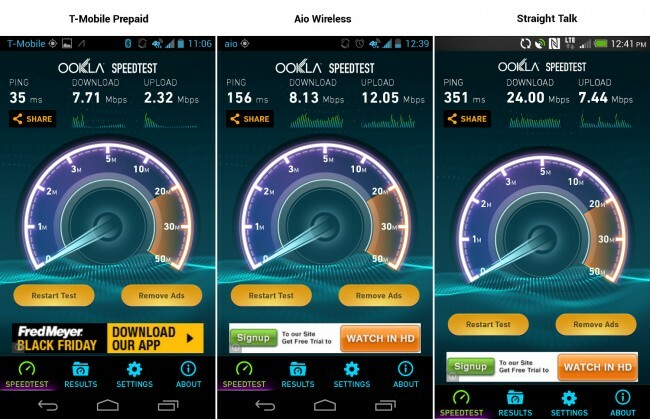 If you aren’t willing to give T-Mobile’s network a chance and expect Aio Wireless to fold at any moment, Straight Talk is probably going to be the service you look to. Now that Straight Talk connects to AT&T’s growing 4G LTE network, there really aren’t many better options than this. For $45, you get unlimited talk, text, and data without a contract at up to 2.5GB of full 4G speed per month. Once you hit that cap, you’ll be throttled – likely down to 2G speeds for the rest of the billing cycle. And that’s pretty much Straight Talk. You have one plan choice (for the most part) at a price that no one else can beat. Now, there are all sorts of horror stories out there that include Straight Talk, but that’s probably because it’s also one of (if not the) biggest prepaid options in the entire U.S. In my testing I haven’t run into issues, plus I also saw much faster speeds than I did with Aio and its capped 8Mbps download limit. Now that a representative from the company has also given us an idea as to when they throttle you, the service should be on your short list. As I mentioned above, I’ve been dedicated to Aio for some time, but will likely cancel that line and switch over to Straight Talk now that my testing of all these prepaid services is over with. The value is incredible at $45 per month and without the unusually-throttled speeds that Aio slaps you with. More info at the Straight Talk site. A month or so ago, T-Mobile and Target teamed up to announce a new prepaid service called Brightspot. It was an odd move for T-Mobile since their plans are now technically prepaid, but when you look at the plans compared to T-Mo’s it makes sense. This is there way to get additional customers in price points and plan options that they don’t currently offer. For example, you can get unlimited talk, text, and data (1GB full 4G speed) with Brightspot for $50, when $50 at T-Mobile would only get you 500MB of full 4G speed data. Then with Brightspot, you can get unlimited talk, text, and data (4GB full 4G speed) for $65, whereas T-Mo has two plans surrounding that at $60 (2.5GB 4G speed data) and $70 (unlimited 4G speed data). So if you didn’t quite want to pony up $70 per month for full unlimited 4G data at T-Mobile, you can pay $5 less through Brightspot and still get up to 4GB of full 4G speed data. I haven’t tested Brightspot, but would imagine it’s no different in service than what T-Mobile offers directly. You should see access to their LTE network. Oh, and if you are a big Target customer, the $25 Target gift card that you receive every 6 months for sticking with the service is a nice perk. More info at Target’s site. There is a pretty good chance you have never heard of Solavei. It’s an MVNO that attaches to T-Mobile’s HSPA+ network (no LTE yet), offering you unlimited talk, text, and data (4GB high-speed) for $49. It has received some play over the last couple of years, mostly as the new scam affiliate program for internet get-rich-quick con artists. You see, with Solavei, they have a tiered referral program that can net you thousands of dollars per month assuming you can refer friends and family, or setup shop on the internet as an SEO expert with your referral link for all to click. It can be shady, that’s for sure if used with an affiliate mindset. And I wouldn’t doubt it if you have seen some of these affiliate a-holes spamming up our comments with their Solavei links. 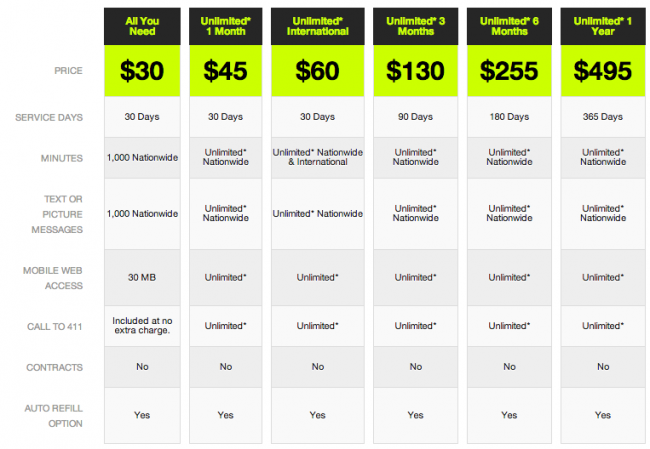 But in terms of service for $49, I had no problems in the four or five months I used it outside of T-Mobile’s coverage. When the Nexus 4 dropped late last year, I went with Solavei because it was super cheap and no one at the time was doing LTE with prepaid. It uses T-Mobile towers at HSPA+ speeds (which are plenty fast) and again, is only $49. At the time I signed up, it was a steal of deal, but now that almost all other prepaid plans offer LTE and Solavei still doesn’t, it probably shouldn’t be on your list. Unless of course, you plan to hawk your referral link to pay for you service. More info at the Solavei site (NOT a referral link). As our long-time friend Taylor Wimberly has pointed out in the comments, MetroPCS is another option for those of you who are good with T-Mobile service. They offer identical plans to T-Mobile, but are $10 cheaper on each level. 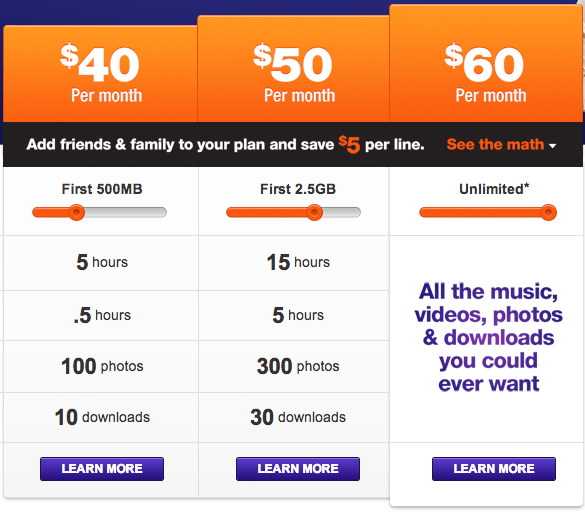 So you can go $40 for 500MB of 4G data, $50 for 2.5GB of 4G data, or $60 for unlimited 4G data. MetroPCS plans also can access T-Mobile’s quickly growing 4G LTE network. I have not personally used their service, though it appears to be a great option. More info at the MetroPCS site. So you probably noticed that we didn’t mention a prepaid service that works on either Verizon’s network and there is a reason for that. Verizon does offer prepaid plans, but they don’t currently work with their 4G LTE network, so I wouldn’t want you to even consider them. Also, unlocked phones won’t work with them either (including the Nexus 5), since Verizon operates their 3G over a CDMA network that is all sorts of locked down. In the end, if you want to go the prepaid route, expect to switch over to T-Mobile or AT&T. Note – I was able to capture a set of speed tests from three of the prepaid services I tested – T-Mobile, Aio, and Straight Talk. You’ll notice immediately in the T-Mobile screenshot that the speeds are terrible. I can’t actually say why that is, other than connectivity in Portland isn’t great or there is something up with the app testing with T-Mobile’s network. I’d say it’s the latter. I used to experience a Speed Test issue with unlocked phones, though that was usually with phones running on AT&T’s network. On all of the tests I ran (which you can see in the screenshot), the speeds jumped up initially into the 20Mbps range, but fell off towards the end leaving it with unimpressive results. The same thing happened when I ran a test on just HSPA+ as well. So don’t necessarily take that to mean T-Mobile prepaid speeds are terrible. It could just be the way the app reacts to T-Mobile’s network. Your speeds should be just fine in everyday use. In the other shots, you’ll see the Aio 8Mbps download cap was definitely in effect, while Straight Talk managed a much more respectable 24Mbps download speed. Phone number transferring: If you are going from Verizon to a prepaid plan and want to take your number with you, you should be able to during the sign-up process with your prepaid plan of choice. They almost all ask you if you want to bring your phone number with you. Keep in mind that once you tell them to bring your phone number over, it should cancel your service with your current carrier. Google Voice: As you all know, I’m a huge Google Voice fan. 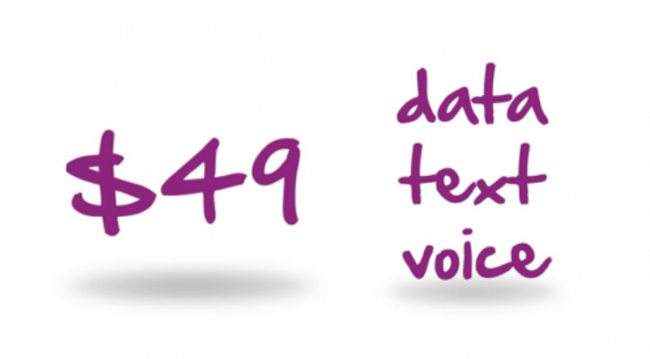 If you plan on testing multiple prepaid carriers, you may want to think about porting your number over to Voice now, so that signing up only means attaching your new numbers from each carrier to a Google Voice number that all of your friends should already have. Just keep in mind that Google Voice still cannot receive MMS messages (picture messages) and will be folded into Hangouts soon enough. Also, the Hangouts boss has already said that once that happens, you’ll get to keep your Google Voice number. Activation: With most prepaid services, all you need to do is order a SIM card through the prepaid carrier of choice, wait for it to arrive, and then follow the instructions on how to get it setup and activated. That process usually involves entering in the IMEI from your unlocked phone, then inserting your SIM into the phone, and following along online with an activation sequence. It typically only takes a few minutes. Billing: Since there are no contracts involved in prepaid service, you can decide if you want to manually pay each month or setup an auto-pay. I tend to keep it on manual in case I don’t want to deal with re-upping the service at the end of the month. Lots of options, right? For me, the prepaid game boils down to a couple of things – how much full 4G speed data you get per month, whether or not that includes 4G LTE, and whose service I trust the most. Almost all of the options I listed above are affordable and offer LTE, so for me personally, it came down to the network I trusted the most. While I love what T-Mobile is doing to shake up the wireless industry, their network didn’t hold up as well for me over the last year. I used a T-Mobile MVNO for months and often ran into areas without connectivity here in Portland, a major U.S. city. I’ve moved my prepaid game over to AT&T because their network is 2nd (in my book) to Verizon in terms of coverage, plus they have LTE in almost as many places. For you that many be different, which is why that $30 T-Mo plan is so damn interesting. If I were just getting into prepaid, I’d most definitely give that T-Mobile plan a shot for a month to see how coverage was in my most often visited areas. If it doesn’t keep you satisfied, start looking at Straight Talk. And last, I know there are probably more prepaid options out there, but these are the big dogs, many of which I have tested for a few months at a time. Hope that all helps.